← Sweet Sorbet and Chalk Talk Card – Stampin’ Up! A “Beautifully Baroque” and “Mixed Bunch” Birthday! – Stampin’ Up! The card I have created for you today features the Beautifully Baroque embossing folder and the Mixed Bunch stamp set (wood mount and clear mount). It is not only beautiful, but also very quick! The best of both worlds for this busy mom and teacher! If you enjoy this card, please leave me a comment. I would love to hear what you think. On March 31st, I will do a drawing and one lucky person who left me a comment will receive a beautiful handcrafted card in the mail! Also, if you enjoy reading my posts, why not have them delivered to your inbox automatically. Just click on the “follow” button in the sidebar. This card is loosely based on the Freshly Made Sketches #124. I began my card by cutting a panel of Whisper White stock, which I dry embossed using the Beautifully Baroque embossing folder and my Big Shot. Then I cut my panel into thirds and adhered them to a Whisper White card base using SNAIL adhesive, leaving about 1/8″ of space between the three panels. Next, I cut a thin strip of card stock and adhered a length of Strawberry Slush Stretch Ruffle Trim to it using SNAIL. 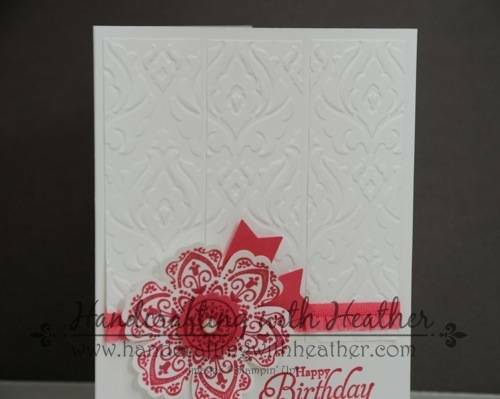 I layered that at the bottom of my embossed panels, then I stamped my flower from the Mixed Bunch stamp set on whisper white card stock using my Strawberry Slush Classic Stampin’ Pad and cut it out using the Blossom Punch. For the center of my flower, I stamped a small medallion from the stamp set with the same ink on Strawberry Slush card stock. The medallion was punched using the 7/8″ scalloped circle punch and layered on top of the flower using Stampin’ Dimensionals and finished with a Basic Pearl Jewel Accent. I used my Banner Punch (Sale-a-bration item available FREE with a $50 purchase until March 31st) to cut out two small banners and used Stampin’ Dimensionals to adhere them to the card behind the flower. 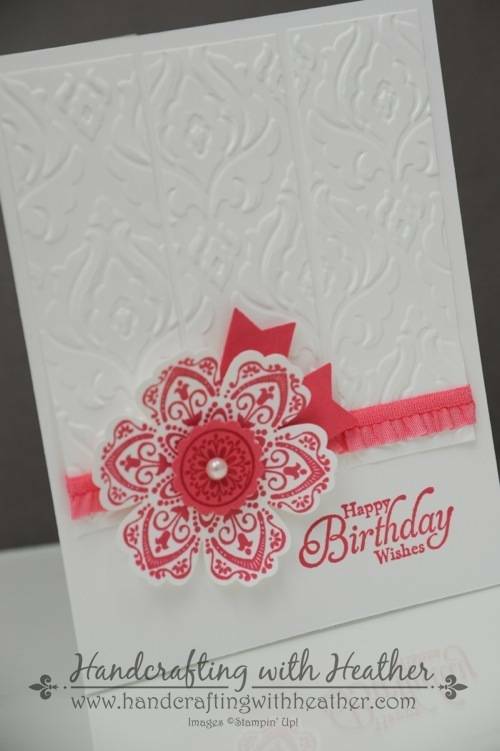 I finished my card by stamping the “Happy Birthday Wishes” greeting from the Simply Sketched stamp set (Hostess Reward Item) in the bottom corner of the card. I used my Stamp-a-ma-jig to make sure I got the placement just right. I just love that tool! As you can see, this card was very simple to make, but elegant none-the-less. If you enjoyed my post, please pin it to Pinterest for me. I am working on building up my blog following and could use your help in getting the word out! If you scroll to the bottom of the post, you will find a “pin it” button just below my supply list for the project… and, don’t forget to leave me a comment for your chance to win a handcrafted card in the mail! for FREE (Sale-a-bration item) with a $50 purchase. Click here to see the Weekly Deals from Stampin’ Up! in my online store. The Weekly Deals are only while supplies last and only available at these great prices through March 3.